May | 2012 | Mike Gil, Ph.D.
Our beautiful home island of Moorea from the stern of the research boat. But despite being tossed around like rag dolls a bit, we got all the data we needed and moved on. The rest of the day was pretty stress free compared to Maiao two days earlier, aside from when I spotted an oceanic white tip shark when we were passing between Tahiti Iti and Tahiti–beautiful animal, but very intimidating to swim with… Luckily, we never saw him/her underwater, and the workday went on as planned, allowing us to tackle 10 sites along the south shore of the island. Also, on the way home at the end of the day, we trolled for just a few minutes and caught a benito (small tuna)– Dinner doesn’t get any fresher! Island Hopping Adventure! : Volume 1 of ? At 5 am Monday morning, we set off under cover of darkness to travel across 60 miles of open ocean on a 26 ft boat to reach the remote Polynesian island of Maiao. 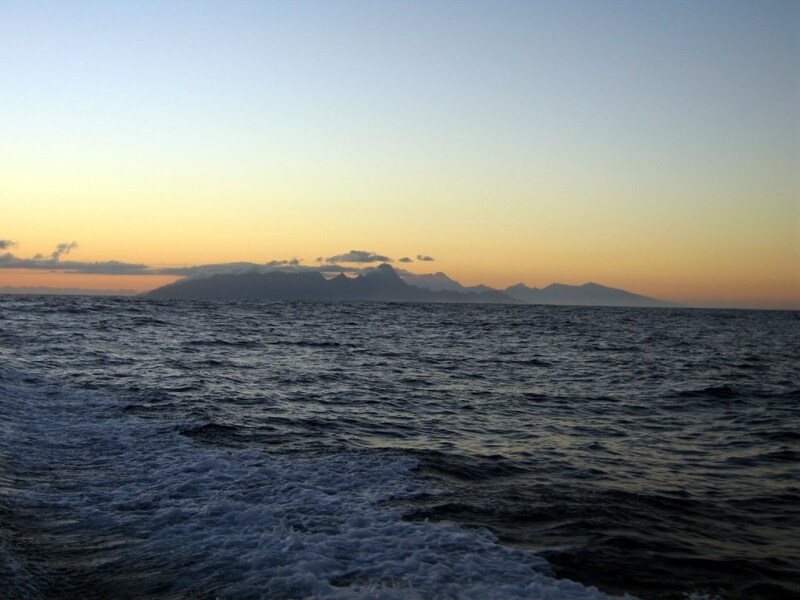 Our view of Moorea in the early morning hours, on our way to Maiao. To give you the inside scoop on this expedition, Maiao is the second of three islands that we are surveying for vermetids—small snails that live on top of corals and are linked to coral die off (see previous post). In this study, we aim to see whether the densities of vermetids differ among reefs that surround three different islands, with hopes to better understand what is causing vermetid populations to flourish and, in turn, kill off corals. Some data suggest that vermetids may thrive under high nutrient conditions, due to higher food availability. 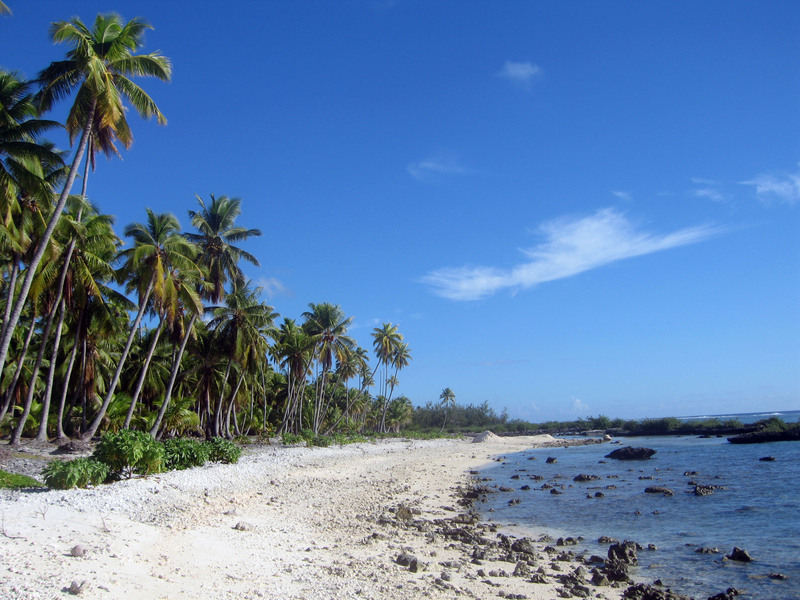 Because human development leads to nutrient pollution, it is possible that human population density is the key to vermetid outbreaks that have recently plagued areas of French Polynesia. As such, the three islands we will survey are subjected to a range of human development, from high: Tahiti, medium: Moorea, and finally low (Maiao). Maiao is inhabited by less than 300 people. When we arrived at Maiao, we were greeted by an unexpected procession. 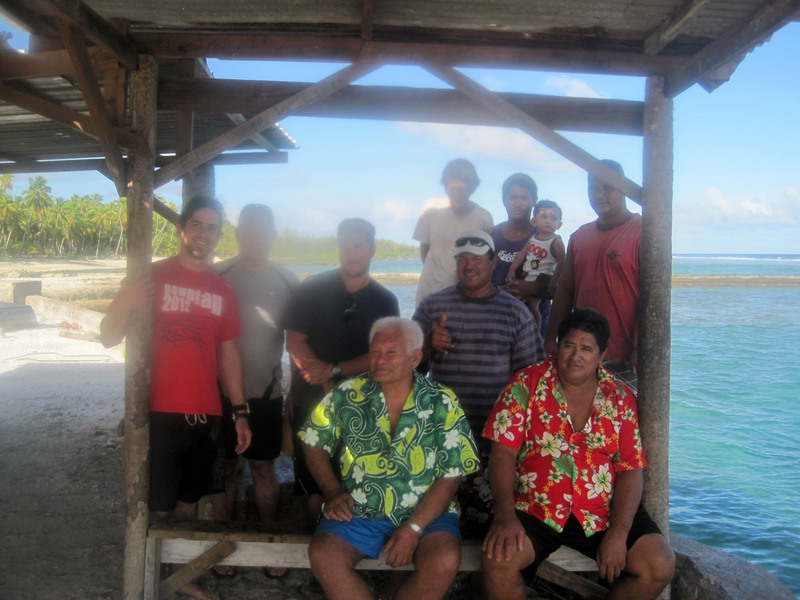 The Mayor of the island, along with some of his family, met us at the one dock (and the one sign of human settlement) on the island’s perimeter. They seemed very excited to see us–men, women, children—a little over a dozen in all. Some of them were especially interested in checking out our scuba gear on our boat. They also brought an impressive brunch, which they setup with some patio furniture. Tuna steaks, fa fa snails (snail salad), fresh coconut milk, tea and firi firi (donut-like pastries) were served in Tahitian portions (large piles). We were happy to oblige and put an impressive dent in the food pile before thanking our generous hosts profusely, grabbing a quick photo with the mayor to commemorate the unique encounter (below), and heading off into the rising sun to collect some data! Hanging with the Mayor of Maiao (in green front and center) and his family, along with Snout and Jeff to my left (coworkers from New Zealand), and Adrian (American colleague, who took the photo). Our work went pretty smoothely, aside from a challenging tidal surge and a kamikaze-like swim into the reef lagoon over the reef crest, which almost claimed our lives (the reef crest is the part of the reef where the waves break–BIG waves in some cases–an important protective service that reefs provide to coastlines around the world). Interestingly, the reef, as well as the vermetid population, seemed to exhibit some clear differences to Moorea, which could yield some interesting results at the conclusion of our study. We sampled from the perimeter of the entire island, which made for some cool sights—the island appeared completely untouched from the reef’s edge and from the shore. Maiao from one of the forereef locations where we were diving for our sampling. Click to enlarge! Maiao’s stretch of untouched beach, just west of the boat dock–the one sign of human life on the coast. Just before calling an end to our work day and making the arduous, journey back to Moorea, which included the super-risky fuel exchange, we received a call from the Mayor offering us fuel to complete our return. Thank goodness! We obviously took him up on the thoughtful offer, and once fueled, headed off into the sunset with some nice data and an unforgettable memory. Back in French Polynesia for the summer! The post below marks the first in a series that I plan to produce while I am conducting research in French Polynesia throughout this summer. So, if you find what I am doing interesting, please stay tuned for more posts 🙂 As usual, all comments are welcome! For the start of this trip, however, I will be working with an international group of researchers in an ongoing effort to understand the ecological consequences of vermetid gastropods on coral reefs. As I mentioned in my last post, these little critters seem to have devastating effects on reef corals, as they feed using projected mucus nets that cover the surface of corals and are linked to extensive coral mortality. Back in January, we started a long-term experiment that will examine vermetid effects on coral communities over the next several years. We did this by removed vermetids from some reefs and allowing them to flourish naturally on others. 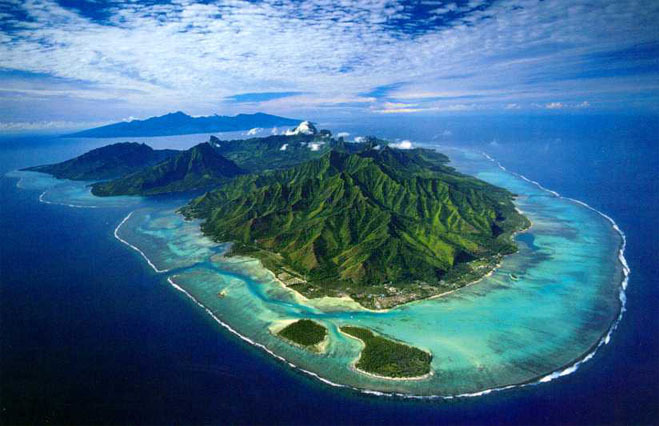 This time (and for the next week), we will be looking at patterns of vermetid abundances across islands, by conducting extensive surveys on the islands of Moorea (where we currently reside), Maiao (an uncultivated island with a population of <500), and Tahiti. We are leaving to sample Moorea in an hour and, weather permitting, we will leave for the 60-mile open ocean journey to Maiao at 5 am tomorrow. Keep your fingers crossed for good weather and calm seas! Thanks for reading, and much more is soon to come throughout the summer! Mass science communication campaign underway! Fishbook: Do prey social networks influence predator effects on reef fishes?